When I was a child, my father traveled several times a year to Maine for work. He was an engineer, and was instrumental in the development of sonobuoy technology for detecting submarines during the cold war. 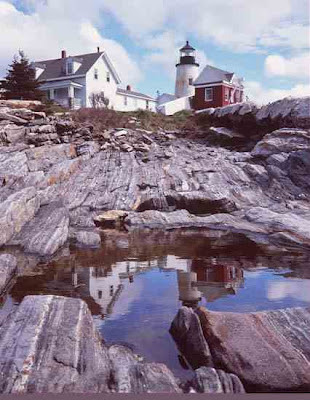 The Navy tested the equipment off the coast, monitoring from the Pemaquid Point lighthouse. Happily for me, in the summer my mother and I often made the long drive from Indiana with my dad, and I spent many happy hours on the Pemaquid rocks and exploring the tidal pools. At Pemaquid I learned that the sea will take back the treasures you gather if you don't move them above the tide line, and that seagulls will take your lunch if you don't keep it safe from aerial thievery. It was there that I met my first sea creatures -- starfish, mussels, and more. It was also in Maine that I met my first author and learned that real people write books. We always stayed at the Pemaquid Hotel, a lovely old place with guest rooms and dining room in the main hotel and "cabins" outside. We liked the cabins because they had little porches where we could sit in the evenings and listen to the frogs that sang in the pond at the back of the grounds. The hotel was owned by the Allens, who lived there year round and opened for guests in the summer months. Some of the elderly guests had been coming to the hotel since they were children, a thought that boggled my pre-teen mind. From the hotel it was an easy stroll to the lighthouse, the rocks, the ten-stool snack and souvenir shop where I bought a copy of Mystery at Pemaquid Point by Mary C. Jane. Serendipity being ever part of life, I took my new book to dinner with me and Mrs. Allen saw it on the table. Her daughter, she said, had been in Mrs. Jane's fifth-grade class a decade earlier. My mother asked how to contact Mrs. Jane, and Mrs. Allen produced her phone number and address. Perhaps my mother saw my future even then. I don't know. What I do know is that she called Mrs. Jane and asked if she could bring her young daughter to meet her and have her book signed. So off we drove to the town of Damariscotta and Mary C. Jane's home for lemonaide and cookies, and a lifelong memory of meeting my first author. I'm off to Maine this coming Friday and will be there for ten days of writers' workshops, readings, talks, and interaction. 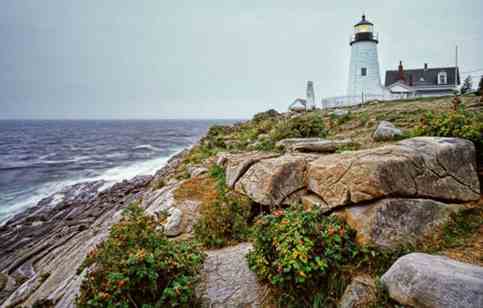 I won't get to Pemaquid Point this trip. but it will always be one of my favorite places in the world. And my memories of Maine will always include the three women who conspired to let me meet the author whose book I loved. Knowing what I know now about most authors, I cherish the idea, too, that Mrs. Jane was as delighted to meet a reader from far away as I was to meet her. Happy Birthday yesterday, O Canada! And Happy Birthday to the U.S. on Wednesday. I hope you'll find your way back here before the fireworks ~ I'll be talking about animals of the American Revolution. Feel free to share a link to your book information. We all love to read! I know Damariscotta and painted there one year when I was writer-in-residence for an artist; lovely area. Have a ball in Maine this week. My best friend lives in Belgrade and I will be up there in September. 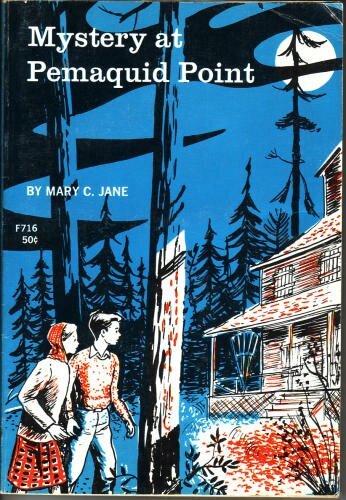 The first mystery I remember reading was an Agatha Christie, and then all of the Nancy Drews, over and over, but I also remember loving The Witch of Blackbird Pond in school. That's great, Jenny! I wish I still had my original Mystery at Pemaquid Point - seriously thinking of getting a new old copy. Enjoy your visit with Lois Duncan! Sheila, thanks for your comments about my Kindergarten Whoop! story. That experience will always be a treasure with me like your meeting your first author. I can imagine how that influenced you. Just think, if it hadn't happened, you might have grown up to be an engineer like your dad. Best wishes to you. Oh, Earl, I don't think so! ;-) Maybe a musician like my mother. Those are always interesting questions, aren't they? I wrote my first book, complete with pictures, when I was about 8, so I may already have been on the path. But the truth is that we never really know whom we have influenced. I'm sure those kindergartners will remember you and, more importantly, they'll have a new perspective on writing that will carry them through their lives. I don't remember for me, but my granddaughter, 12, recently walked by one of my books and said, "That's what everyone meant when they said you write books?" We had a nice conversation about it after that revelation. Now she's busy writing her own story this summer. How cool is that? Joyce, that's very cool! I'm scheduled to teach a writing class for Middle School students this summer (1 week of afternoons, no grades, no homework!) and another for High School, and am hoping the classes fill so they will run - I'm quite excited about them! This is a really sweet piece, Sheila! My husband and I just explored the Point last month with his kids who now live in Texas. They grew up in Maine, but have been away for decades, so a trip to the coast is always mandatory when they visit. A tip for next trip...have you ever eaten at Shaw's Lobster Pound in New Harbor? It's deck is right over a working harbor with lobstermen and women unloading their catches. It's gorgeous, the seafood is great, beer and wine available and when it's cold or wet, there is indoor seating with the old honey-pine paneling on the walls. Feels like going back in time. As for knowing that real people wrote books...hmmm. I'm not sure. But I did read from an early age everything I could get my hands on, especially mysteries. I'll try to read the one you refer to.